Forging(Hada): Forging mark is fine wooden grain mark of Itame-hada and conspicuous streaming ware of Masame appears on Shinogi-ji. The weaved scene of forged smelting steel and flexible iron generates darkish line of Nie so called "CHIKEI" clearly against the sparkling Ji-nie glitter. On the upper Shinogi-ji in front, there appears streaming loosen ware along Masame. Temper(Hamon): Hamon is rather on stronger side Nie-based that forms deep crystallized quenching line of round head Gunome zigzag with some sharpened head of Togari-ha so called "Sanbon-sugi" hamon. Sparkling hard metal granules of coarse Nie splashes from head of Gunome here and there. The interior is filled with mist-like crystallize area that contains great deal of feet "Ashi" and long or short lines of Nie so called "Kinsen" or "Sunagashi" activities.The entire quenching scene is vividly bright. In the interior of temper on the lower of Hakiura-side, there is a loosen ware in about 90mm long tracing along Kinsen line that comes from forging process. Temper of tip(Boshi): Temper of boshi forms irregular Gunome, small circle with an indication of abundant brushing Hakikake activity then turns back deeply in tight end. Tang(Nakago): Nakago is UBU original, un-even U-shape "Ha- agariKurijiri" heel shape on bottom. One peg hole of Mekugiana. Crossed "Higaki" filemarks. Back ridge of Nakago is flat. The signature in front is 2 large character that reads KANEMOTO 兼元. The famed maker 2 nd generation of KANEMOTO 兼元, one of the most distinguished makers who ranks with KANESADA 兼定 as a star sword smith who was an extraordinarily skillful maker with top ranking of the most supreme sharp cutting performance among all "Saijo-Ōwaza-mono" 最上大業物 and it has been highly praised and named as "Makoroku" 孫六　by his nickname. The KANEMOTO 兼元 and other maker of MURAMASA 村正 - they are familiar with many anecdotes about Japanese swords histories. The founder KANEMOTO 兼元 had appeared circa Bunmei-Eisho (1469-1520) era and it seldom found the typical temper line of "Sanbon-sugi" hamon with his works. It is understood that "Sanbon-sugi" hamon was created and nearly completed by the 2 nd generation so called "Makoroku" in his later age. The famed smith "Makoroku" KANEMOTO 兼元 was aggressively active during circa Daiei-Kyoroku era (1521-31) and supposed his activity 30 - 40 years till end of Tenbun era (-1554). The age of Tokugawa began to Shinto period, assuming the name of KANEMOTO were transmitted both to Tashiro Gen'ichi KANEMOTO 田代源一兼元 and Kaneko Makoroku 金子孫六 lineages. Also the famed artisan 11 th generation Aizu KANESADA 十一代会津兼定 initially named himself KANEMOTO 兼元 prior to official naming Izumi-no-kami KANESADA 和泉守兼定. In these modern times, the artisan Kaneko Tatsuichiro 金子達一郎 - a holder of an intangible cultural asset worn the last title of 27 th generation KANEMOTO 二十七代兼元 who passed away in 2008. 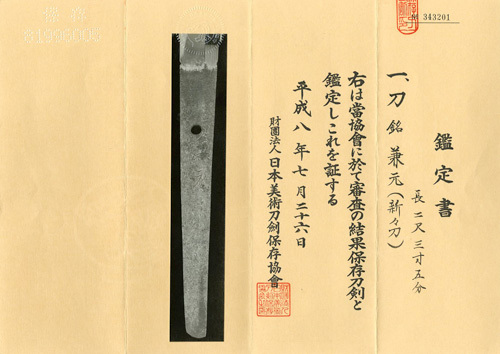 The subject katana is judged as a work by KANEMOTO 兼元 during Shin-shin-to period in Ansei era (1854-). It is assumed this katana was owned by a Samurai warrior of matchless valor holding awe-inspiring power of legitimate workmanship of KANEMOTO 兼元. Copper ground silver plated habaki collar, preserved in a plain wood mounting Shirasaya. Old polish/Condition scale: good (using a scale of mint-excellent-very good-good-fair-poor). Some minor scratches appears due to old polish that will be eliminated by skilled polish.